This is old version Hearthstone Heroes of Warcraft 5.2.13865 apk for Android, you can install it if you want to downgrade or install old app. It is top Casual apps from Blizzard Entertainment, Inc.. There are nine heroes in Hearthstone. Each of them has special abilities and powers. The deck combination is available in various options. Playing Hearthstone with the Android cell phone is not bad at all. 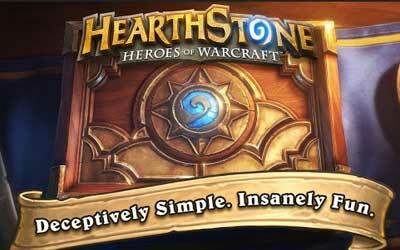 Every part of Hearthstone can be accessed easily via the mobile application. However, don’t expect to get a user friendly deck building. It also has limited access to the B-net capabilities. The deck list is very small to access from the mobile phone. It is a little bit hurting to view the arena draft. When you want to get gold from the game, you need to win in the arena or successfully finish the challenges. The players can use the gold to purchase the packs. On average, a player gets five packs every day if they try to finish challenges. You will get a free classic pack if you try the application. Despite the cons available in the game, Hearthstone Heroes of Warcraft for Android is still worthy to try as it has varied decks and fun characters.